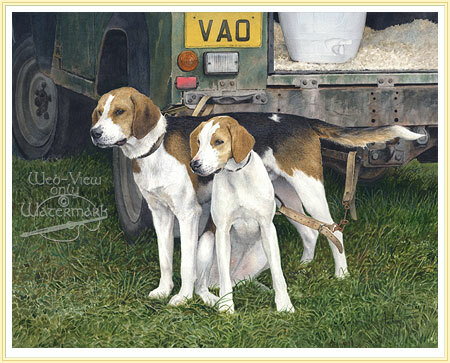 The English Foxhound was originally bred as a pack hound, to trail foxes and to run with horses. The breed is very social and tolerant, enjoys human companionship, it is on average 21 to 25 inches tall to the withers and weighs in at 65 to 75 pounds. The skull is wide, the muzzle is long, legs are muscular, straight-boned, and the paws are round. It is very energetic, plenty of exercise and plenty of space to run are essential. The breed dates from the latter half of the sixteenth century.